Record low temperatures and several nor’easters didn’t block the BWRFC from a strong start to their 2018 spring season. After several weeks of intense conditioning at the Medford BSC, Boston Women’s partnered with the Boston Rugby Football Club to use their new bubble-covered turf facilities at Union Point in Weymouth. Though Boston was unable to practice outdoors before the start of the season, they were undeterred as they traveled to New Jersey on March 24 to play a Gold Cup match against Detroit. 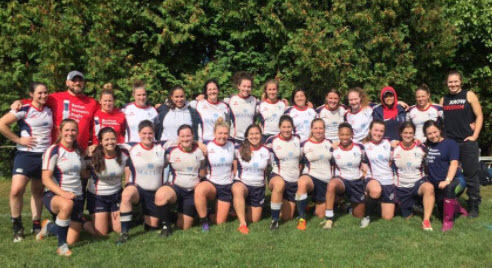 The BWRFC prevailed 17-0, dominating in the scrums and bolstered by strong performances from scrappy flanker Katie Tomkewicz, flyhalf Dee Nash, and center Cathy Ordile. 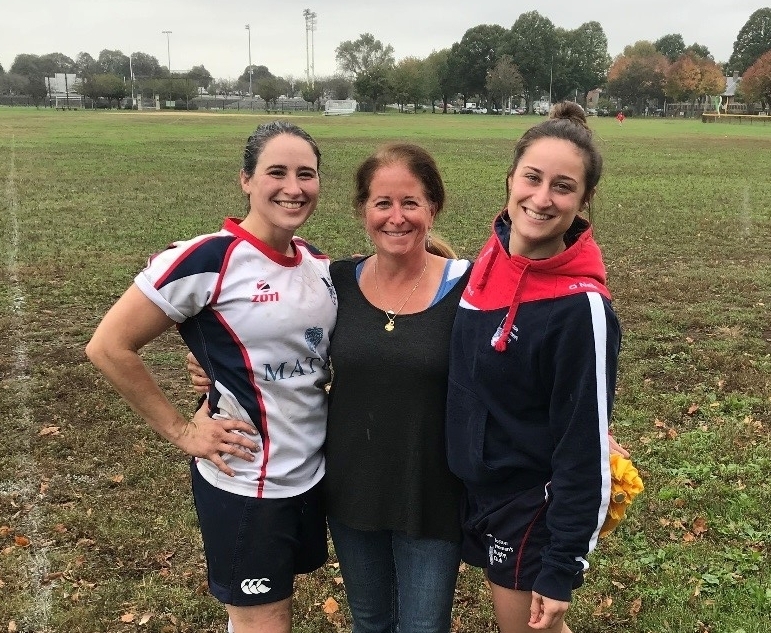 The following weekend, Boston Women’s participated in the 6th annual MYRO High School Girls Rugby Jamboree at Lincoln-Sudbury HS, run by BWRFC alum Sarah Greeley. After two friendlies against Charles River and Beantown, all three women’s clubs worked with high school players to hone position-specific skills. Incredibly, over 300 athletes attended the Jamboree, showing just how large rugby has grown in Massachusetts. After a gumbo dinner hosted by the Bouma family, Boston came out ready to play in an early 9AM kickoff against Houston. Though they trailed in size, the forwards maintained consistent lineouts with jumpers Mick Conway and Elise Ordile challenging every throw. The backs showed their strength with heavy-hitting centers. Inside center Paige Stathopoulos flattened Houston both on offense and defense and outside center Gael Yotts ran phenomenal strike lines putting players on their heels all game. Rookie Meredith Outterson stepped on the pitch at lock in her first official match for Boston. Ultimately, Boston took home a win, 22-15. A multi-team social at Bubba’s Bar & Grill and tourist activities including visiting NASA, several breweries, a bat colony, and the zoo capped off another successful weekend for the BWRFC. This weekend, Boston will host New Haven at Moakley pitch on their Friends & Family Day. Following the match, the annual Open Bar will be held at Sunset Cantina (tickets available here). Check out the match schedule for upcoming games. BOSTON, MA: The Boston Women’s Rugby Football Club is proud to announce Laura M. Cannon Attorney at Law, as a new Bronze Sponsor and a sponsor of Boston 7s, a fierce and fun, competitive summer 7s tournament attracting many of the country's top-ranked teams. Since 1988, Laura M. Cannon has specialized in Real Estate law and Estate Planning for both Buyers and Sellers in Massachusetts. With over 25 years of experience, her connections with local Real Estate Brokers and Lenders can assist you in either the Purchase or Sale of your home. Laura M. Cannon Attorney at Law office is located at 685 Main St. Waltham, MA. For more information please give a call at 781-894-3309 or connect via Facebook. Our schedule features two matches against fellow NERFU Division I team, Albany, as well as five games against Division II Senior Clubs. In November, we'll travel to Northern Virginia to take on NOVA and Raleigh in the Gold Cup. And in the spring, we'll be headed to Texas and New Jersey to compete against four other teams. We’ve had an incredible 2017 so far - contact us for more information about our competitive fall 15s season! Whether you played rugby for years or have never heard of it before, all athletes are welcome to give it a try! The BWRFC once again volunteered for the Making Strides Against Breast Cancer walk this fall, and are looking forward to more community activities coming up. We also have our fall rookie day on October 22 and our annual pub crawl on December 2. Mark your calendars! Looking to update your Boston Women’s Rugby swag? Look no further! Search through our online store to find the best options for cheering on Boston Women’s Rugby Club in style. Looking to continue your rugby season throughout the summer? Interested in trying a new sport? Come join Boston Women's Rugby as we kick off our summer 7's season! All ability levels are welcome whether you are a seasoned veteran or new to the game! Practices will be held on Tuesday/Thursday evenings with Saturday tournaments scheduled throughout June/July. We will be entering both a competitive and developmental side into each tournament, so all players will get a chance to compete in tournament play! We’re kicking off a new fall season with Boston Women’s Rugby Club! We’ve had an exceptional 2016 so far and you can be a part of our 2016-2017 competitive season! Interested players can email us directly at join@bwrfc.com or check out more information for new players in our New Players Page. Whether you played rugby before or not – all athletes are welcome to come out and give rugby a try! You won’t regret it, rugby is like nothing else! Congratulations to BWRFC 7s Nationals Players! Boston Women’s Rugby Club competed at the USA Rugby Club 7s National Championships on August 11 and 12 and the 12 players that represented the team made us so proud! After a tough summer of competition – Boston Women’s earned the 2nd Northeast Seed into the Championship, just behind NY’s Old Blue Women’s Team, and returned to the championship for the 2nd year in a row. Tight play in the pool round including a 17-15 victory over Chicago and a 14-12 loss to NOVA led Boston into the playoff rounds playing some of the best 7s ever. Boston advanced to the Shield final and lost in a redemption match to Chicago – but the team grew exponentially and competed well at the highest levels of competition. In another victory – we had an tremendous summer with all our 7s players. With collegiate players from BU, BC, UConn and other area teams, as well as an overwhelming increase in numbers, we consistently fielded 2-3 sides at summer tournaments and succeeded in building some of the best 7s rugby for the most players out there. We’re so proud of our Summer 2016 7s accomplishments and can’t wait for next summer to play again! We can’t wait to see so many Boston Fans coming out to catch our matches this fall! For more information please check out our schedule for the most up to date information! Home games are scheduled at Joe Moakley Field in South Boston, and directions can be found on this page. You may notice our scheduling has changed a little – Boston Women’s is taking part in an inaugural competition between Competitive Regions in the Division I Women’s Bracket. So in addition to playing the tough competition in the Northeast – we’ll be competing against top teams from other competitive regions in the country. This means in October we’ll face Raleigh Women’s Rugby Club at home and in November we’ll travel face Midwest teams Chicago North Shore and Minnesota Valkyries. This new opportunity is a great way to connect with some amazing teams across the country during our competitive season! Stay tuned for results and read a great summary of the endeavor at The Rugby Breakdown! The Boston Women’s Rugby Football Club competed at the USA Rugby Club 7s National Championships on August 11 and 12 and the 12 players that represented the team made us so proud! After a tough summer of competition, Boston Women’s earned the 2nd Northeast Seed into the Championship, just behind NY’s Old Blue Women’s Team, and returned to the championship for the second year in a row. Tight play in the pool round including a 17-15 victory over Chicago and a 14-12 loss to NOVA led Boston into the playoff rounds playing some of the best 7s ever. Boston advanced to the Shield final and lost in a redemption match to Chicago – but the team grew exponentially and competed well at the highest levels of competition. In another victory – we had an tremendous summer with all our 7s players. With collegiate players from BU, BC, UConn and other area teams, as well as an overwhelming increase in numbers, we consistently fielded two or three sides at summer tournaments and succeeded in building some of the best 7s in the region. We’re so proud of our Summer 2016 7s accomplishments and can’t wait for next summer to play again! The team traveled to Washington DC to take part in the second Gold Cup. The BWRFC performed well against Mid-Atlantic teams Raleigh and NOVA. The Gold Cup will continue in the spring with matches in Texas and New Jersey.